Our lifestyle is increasingly international, and travel seems to be the number one topic of discussion amongst our peers. Traveling is such a social activity that our team found it insufficient that the most common way of receiving personalised travel recommendations is through computer-generated suggestions, based mainly on our private online activity. As the people around us are becoming more experienced globetrotters, we can rely on our personal connections for travel guidance now more than ever. 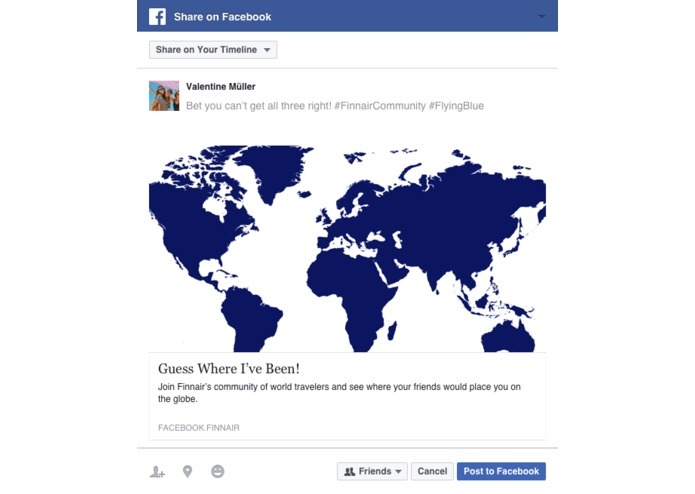 Why not then make use of this community in generating travel recommendations? 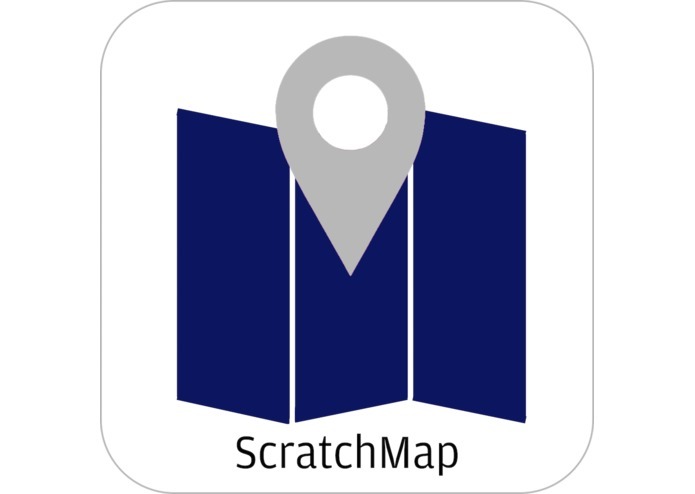 ScratchMap is our solution to the rise of impersonal travel recommendations. We have gamified travel recommendation creation, so that rather than personal information being collected and used for targeted content, data playfully generated by your self and your friends is evaluated for creating you the best possible experience while searching for your next destination. 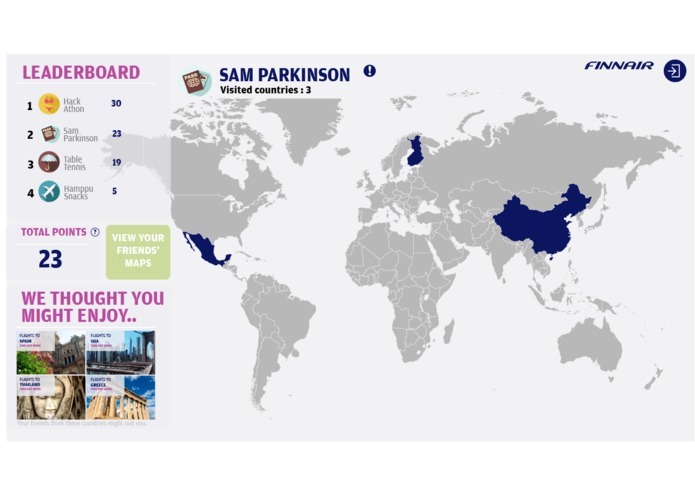 The game provides the user with an empty scratch map which they can publish on their Facebook feed. The publication invites the user's contacts to guess which countries the user has traveled to. After this, the user will get a notification that someone has visited their map and will have to review their friends’ guesses. Interactions will result in points which will determine a users place on the leaderboard. When the user confirms or rejects the guesses, Finnair will obtain information about the user’s travel history. If the user rejects a guess, the application will then ask them if they would be interested in traveling to the country in question with options to choose from yes, no or maybe as answers with all these contributing to Finnair’s user data. We have build a client and server side node.js web app which connects to FB Profiles allowing the usage of the FB Graph API. Our backend uses a MongoDB database. We additionally use the Finnair API to give a list of flights for a users destination recommendation. The client side code is hosted in a Google storage site, while the server side code is hosted in a google web app and MongoDB virtual machine. Finding a free API that provides an image search and a fast response was difficult and we had to resort to manually creating a database of images. We also used new technology that proved to be more challenging than thought beforehand. It was also challenging to come up with a way to transmit our ideas verbally through the application. The layout of the game is very clean. It reflects the Finnair website with a matching colour scheme and even has the same typography. Our group also held up well despite the tiredness and unexpected obstacles and commmmunication was succesful. Our team works well together, we are systematic and good at delegating specific tasks while staying focused. We also learned more about the Facebook API and how to use it in practice. To focus on cities and their specific attractions. Include other aspects as a blogging platform and photo sharing. Enrich data which is used for recommendations e.g. seasonal travel and weather information.